↑ 5.0 5.1 5.2 Buncombe, Andrew (19 September 2011). "A rebirth dogged by controversy". The Independent. London. पहुँचतिथी 10 अक्टूबर 2012. ↑ "India Gujarat Chief Minister Modi cleared in riots case". BBC. 10 April 2012. पहुँचतिथी 17 February 2017. ↑ "SIT finds no proof against Modi, says court". The Hindu. 10 April 2012. पहुँचतिथी 17 February 2017. ↑ Joseph, Manu (15 February 2012). "Shaking Off the Horror of the Past in India". The New York Times. ISSN 0362-4331. पहुँचतिथी 19 May 2017. ↑ Mishra, Pankaj (अप्रैल 2011). Visweswaran, Kamala, संपा. Perspectives on Modern South Asia: A Reader in Culture, History, and Representation. Wiley-Blackwell. प. 188. ISBN 978-1-4051-0062-5. 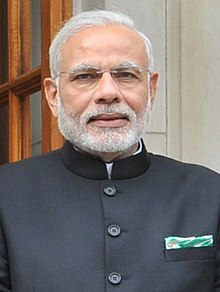 The chief minister of Gujarat, a young up-and-coming leader of the Hindu nationalists called Narendra Modi, quoted Isaac Newton to explain the killings of Muslims. "Every action", he said, "has an equal and opposite reaction." ↑ "Indian PM Narendra Modi still mired in controversy, says expert". Canadian Broadcasting Corporation. 16 April 2015. पहुँचतिथी 17 February 2017. ↑ Nair, Rupam Jain (12 December 2007). "Edgy Indian state election going down to the wire". Reuters. पहुँचतिथी 10 अक्टूबर 2012. ↑ Robinson, Simon (11 December 2007). "India's Voters Torn Over Politician". Time Magazine. पहुँचतिथी 10 अक्टूबर 2012. ↑ Burke, Jason (28 मार्च 2010). "Gujarat leader Narendra Modi grilled for 10 hours at massacre inquiry". The Guardian. पहुँचतिथी 10 अक्टूबर 2012. ↑ Marino 2014, pp. 13, 15, 29–30, 74. ↑ "Narendra Modi belongs to Modh-Ghanchi caste, which was added to OBCs categories in 1994, says Gujarat government | Latest News & Updates at Daily News & Analysis". dna (English में). 9 May 2014. पहुँचतिथी 19 May 2017. ↑ "PM Modi's brother asks Teli community to adopt 'Modi' prefix". The Indian Express (English में). 20 November 2016. पहुँचतिथी 19 May 2017. ↑ "'Modi is a Teli-Ghanchi OBC': BJP - Times of India". दि टाइम्स ऑफ इंडिया. पहुँचतिथी 19 May 2017. ↑ "'Modi is a Teli-Ghanchi OBC': BJP". दि टाइम्स ऑफ इंडिया. 23 April 2014. पहुँचतिथी 17 February 2017. ↑ Ghai, Rajat (7 May 2014). "The office of Prime Minister: A largely north Indian upper-caste, Hindu affair". Business Standard India. पहुँचतिथी 19 May 2017. ↑ "'I have a special association with tea', Modi tells Lankan Tamils". www.oneindia.com (English में). पहुँचतिथी 19 May 2017. ↑ Sinha, N. C. High School Essays (English में). प. 20. ISBN 978-93-5186-604-6. ↑ Jose, Vinod K. (1 मार्च 2012). "The Emperor Uncrowned". The Caravan. पप. 2–4. पहुँचतिथी 11 April 2013. ↑ Marino 2014, p. 16. ↑ Mukhopadhyay 2013, p. 82. ↑ "Modi's life dominates publishing space (Election Special)". New Kerala. 14 मार्च 2014. पहुँचतिथी 4 April 2014. ↑ Marino 2014, p. 24. ↑ Marino 2014, p. 21. ↑ Marino 2014, pp. 22–23. ↑ Marino 2014, p. 25. ↑ Marino 2014, pp. 30–33. ↑ Mukhopadhyay 2013, pp. 128–129. ↑ "Narendra Modi invited to Ramakrishna Mission's headquarter in Belurmath". The Economic Times. 26 मई 2014. पहुँचतिथी 17 अक्टूबर 2014. ↑ "The tale of two Narendras: Narendra Modi and Swami Vivekananda". दि स्टेट्समैन. 5 जुलाई 2016. पहुँचतिथी 17 फरवरी 2017. ↑ Marino 2014, p. 26. ↑ Marino 2014, p. 27. ↑ Marino 2014, pp. 28–29. ↑ Mukhopadhyay 2013, p. 131. ↑ 43.0 43.1 Mukhopadhyay 2013, p. 138. ↑ Unnithan, Sandeep (2014). "The man behind Modi: Lakshmanrao Inamdar". India Today. Ahmedabad. पहुँचतिथी 22 May 2014. ↑ Mukhopadhyay, Nilanjan (2014). "Narendra Modi: The making of the political leader". पहुँचतिथी 22 May 2014. ↑ Marino 2014, p. 35. ↑ 47.0 47.1 Marino 2014, pp. 35–40. ↑ Goyal, Prateek (18 May 2014). "Mentoring Modi". Pune Mirror. पहुँचतिथी 21 जून 2015. ↑ "Narendra Modi degree row: DU college says it has no data of students passing out in 1978". India Today. पहुँचतिथी 9 जून 2017. ↑ Marino 2014, p. 48. ↑ "Narendra Modi's degree 'authentic': Delhi University Registrar Tarun Das". The Hindu. पहुँचतिथी 9 जून 2017. ↑ Avasthi, Yogesh. "Globetrotting PM Modi was weakest in 'International Relations'". पहुँचतिथी 17 February 2017. ↑ "Modi proves to be an astute strategist". Hindustan Times. 23 December 2007. पहुँचतिथी 17 April 2014.